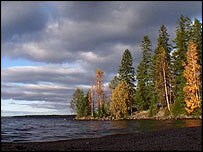 With 200,000 lakes, almost one-tenth of Finland's total land area is covered by water. The Nordic country's lakes supply water for its five million inhabitants - and every Finn uses an average of 145 litres of water each day. In 2003, a UN survey ranked Finland's water first out of 122 countries. So what makes their H2O better than anyone else's? In Finland, groundwater requires very little treatment for use in the water supply. But surface water from lakes has to be treated because it contains large quantities of organic matter - especially when a lake has no river to carry the sediments away. The issue is featured in Hands On - Green Currents, a film in the Earth Report series made by TVE and shown on BBC News 24, BBC One and BBC World. About 150km (93 miles) north of Helsinki, the Tampere Water Plant treats about 40 million litres every day using a technique called Dissolved Air Flotation (Daf). There are four stages in the Daf process. Firstly, chemicals are added to the lake water, encouraging organic matter to float to the top. Secondly, water is aerated with bubbles to push the organic clots to the surface. The third stage is to channel the purified water into basins with sand filters, removing any last bits of organic matter. Finally, any remaining odours are neutralised. 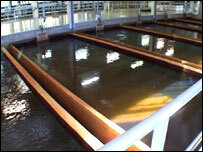 "One of the benefits of the flotation unit that we [have] used since 2000, is that it was able to use old basins. In fact, all the construction that we did was wood, which is quite a cheap material," Jukka Meriluoto, of the Tampere Water Plant, told TVE. But the technique goes beyond Tampere. Organic matter in Finnish rivers has been reduced by 87% compared to levels in 1970. The technique is being exported to other countries. In northern Brazil, residents in the town of Oroba are using an altogether different method in order to purify water and prevent disease. 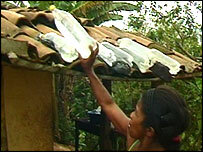 The town's inhabitants have taken to a surprisingly simple process called Sodis (Solar Water Disinfection Process). There are several stages to Sodis. Firstly, a clean, two-litre bottle needs to be filled up to three-quarters of its volume with water. The bottle is shaken for 20 seconds to oxygenate the water. Then, the rest of the bottle is filled and the top screwed on. It is then placed on a rooftop in direct sunlight for six hours. The ultraviolet (UV) radiation from the Sun's rays eliminates virtually all disease-causing bacteria, viruses and micro-organisms. "This method is very efficient if you follow the simple procedures," says Professor Jose Euclides Paternini of the Unicamp University, Sao Paolo. "The Sodis method can be used in many countries, but especially those close to the equator with high solar radiation, and where the population has no access to conventional water treatment." Luiz Barbosa has been a community health worker for 10 years, looking after 118 families in Oroba. He has observed the difference Sodis has made to the health of his community. "The water treatment we are using here in this municipality is Sodis - that is purification through the Sun's rays - and it is working well because the children are healthy, smiling and they're enjoying a healthier life," he explains. 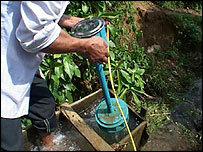 Elsewhere in the world, water is providing a source of renewable energy for rural communities. Hanoi, the booming capital of Vietnam, epitomises the country's Asian tiger status. But while the standard of living in the cities has risen dramatically over the last few decades, in the countryside it is a different story. 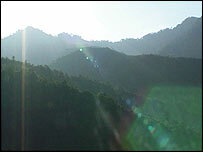 The mountainous Da Bac province, outside Hanoi, is home to the Muong indigenous ethnic group. Many are rice farmers and few can afford the electricity from the new pylons that line the valleys. Instead, they are turning to a low-priced alternative. Pico Hydro is a small-scale version of conventional hydro-electric power generation. The streams at the bottom of the valleys are powering a low-tech grid for the people of Da Bac. Pico Hydro units need only a constant water supply and a slope with a one-metre drop. This produces a flow rate that can drive a turbine fast enough to generate electricity, providing houses with a direct power supply. In some villages nearly every household has one. Imported 300-watt turbines cost about US$20, and have proved to be the most popular. "Using Pico Hydro is really easy. There aren't any difficulties. It's actually more difficult to use the high voltage grid - it's much more expensive for us," says Ban Van Giang who lives in Da Bac. "With better lighting, my wife can work and walk in the house easier, and my children can have better light to do their homework." Vietnam has the world's highest uptake of Pico Hydro, with 120,000 units installed so far.